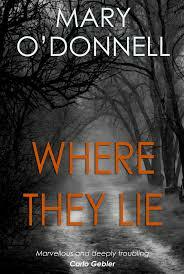 BleachHouseLibrary.ie: Book Review - "Where They Lie" by Mary O'Donnell. Gerda dreads the phone ringing, yet knows she must answer. The caller claims to have information about the whereabouts of missing brothers, Sam and Harry, who are among Northern Ireland's 'Disappeared'. There has always been doubt as to the level of their involvement in Ireland's 'Troubles' but their family and friends need closure. Without bodies, they cannot achieve this. Will thesde mysterious phone calls shed light on the disappearance, or re-kindle old flames of fear? Mary O' Donnell has a distinctive literary voice. Strong yet silent, bold but not brash. She uses four main characters to bring her story to life. Gerda and her on/off boyfriend Niall, along with Gideon (Gerda's brother) and his wife Alison. The four of them each have their own take on the disappearance of the twins, but all crave some answers. As the reader is given a glimpse into the thoughts and actions of each character, the workings of Northern Ireland come to life. The peace process may have changed the atmosphere of fear and mistrust, but the past is not easily forgotten. Tensions still exist and the religious divide is ever-present. The streets are still nervous and the mural-painted walls are an ever-present reminder of the North's history. Niall is the 'southerner' of the group and his travels over the border are regular but seem to be done with a heavy heart. The author uses words to portray the crackles of uncertainty between north and south, and the relationship between Gerda and Niall has its own fractured moments. Alison holds bitterness close to her chest, unleashing her anger on her husband and his sister when it becomes too much. This is a novel that is written with powerful prose, great insight and confidence. However, it was just a little too vague for me. I was moved by the words and the atmosphere yet I found it was more like an extended short-story than a complete novel. Gerda was a wonderfully formed character but Gideon was lacking something. The talent of the author is undeniable and I can completely understand how she has won so many literary prizes. This is a haunting read, with ripples throughout of Ireland's recent, painful history. Perhaps the unsatisfied feeling that I experienced upon finishing the novel is more to do with my lack of understanding as to the feelings within Northern Ireland than of the story itself. I live so close to the border between north and south, yet it may as well be a million miles away. I remember the long drive from Dublin to Belfast (pre-M1 days) and my pounding heart as I witnessed the checking of cars at the border crossing beyond Dundalk. Passport checks, changing of punts to sterling and my first glimpse of an armed officer. But I was a southerner, unused to the tensions and uncertainty that the locals lived with on a daily basis. Where They Lie is an evocative look at life in Northern Ireland and the unanswered questions that still remain there today. The past is interlinked with the future is this tale of trying to move forward in an unsettled present. Where They Lie is published by New Island and is available in paperback and ebook format.